When it comes to tattoos, men choose them very rarely according to fashion trends. They usually go for rather meaningful ones, which represent something important in their lives. Things get really serious when we are talking about tattoo quotes for men as they literally describe beliefs or values of the owners and are highly relevant for their personality. These kinds of tattoos are most likely the most significant ones out there. Most of them never include any sophisticated or highly artistic designs as they are focused only on the meaning behind the words inked forever on man’s skin. They are not about aesthetics or art, but about remembering key quotes that can make a man stronger. Their meanings vary from one tattoo to another. However, behind every one of them there is a highly personal story that impacted the man in a certain way. Though you might think that you totally understand the quote, it might have a very different or even hidden meaning to the owner. After all, any quote can be interpreted in various ways according to the life experience of the reader. Sometimes the individual decides to share the message with the world by getting a tattoo in a visible place. But other times the emotion is too personal so he goes for a very discreet body part that won’t be vulnerable to pry eyes. Such tattoos are very simple so they are never chosen because they look cool. On the contrary, despite the fact that beautified latters can look highly appealing, they always stick to the purpose of conveying a message, which is nearly always addressed to the owner and set as a reminder that will help him in the journey of life. Even if they incorporate design elements, they are always very masculine and enhance the visual appeal of the body. Tattoo quotes for men are usually inked just in black and grey, yet the ones that contain designs can go for a broader range of shades. Why are they popular amongst men? 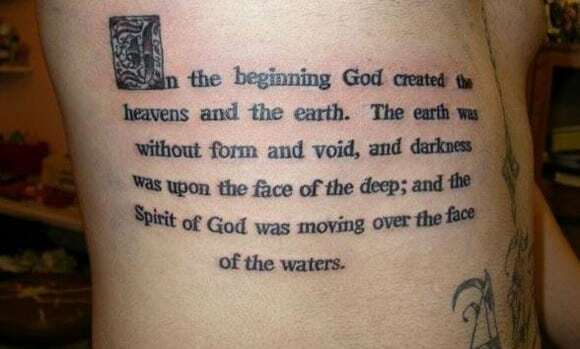 Tattoo quotes are very popular amongst men not only as stand-alone ones, but also as part of bigger pictures that reveal even more about their life experiences, preferences or beliefs. They help the man reconnect to spirituality and to his own emotions concerning important events or chapters in life. Whether they originate in poems, speeches, movies or books, these kinds of tattoos always contain priceless knowledge for the owners. Sometimes a single quote can resume the whole personality of the man. Other times, it is rather mysterious and it leaves people wondering. In any case, any tattoo quote is full of essential significance and it represents real guidelines or mottos of the individual. They can have therapeutic properties and help the man heal past wounds or just help him move on and become more successful. According to many tattoo lovers (http://fabulousdesign.net/tattoo-quotes-men-women-girls/), tattoo quotes for men don’t only play a role into catching the eye, but they can provide insight into the philosophy of a personality and the beliefs of the tattoo owner. They can define a way of life, which inspires the man and motivates him to achieve the fulfillment that he longs for. This quote tattoo features one of the most well-loved quotes from the Calvin and Hobbes series. 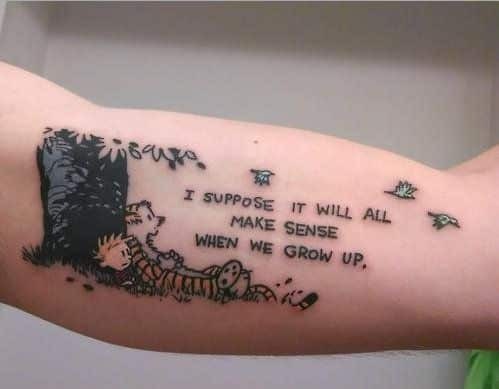 In the colored part of this tattoo design, Calvin and Hobbs are shown resting against a leafy tree, and the quote is inked above them in black. 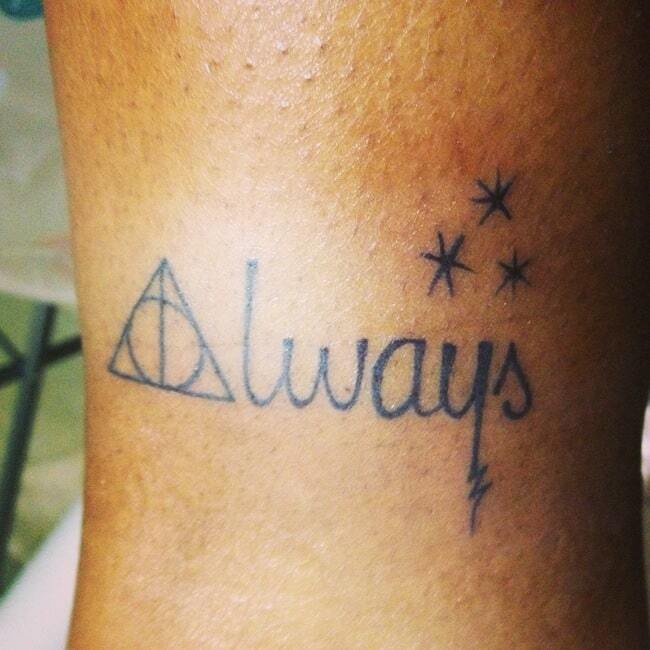 This tattoo is related to the Harry Potter series. It features the word “Always,” with the A being comprised of a split triangle with a circle inside. This symbol was used in Harry Potter and the Deathly Hallows. The letter “y” in the tattoo is jagged, the same shape as Harry’s scar. Three stars complete the image. 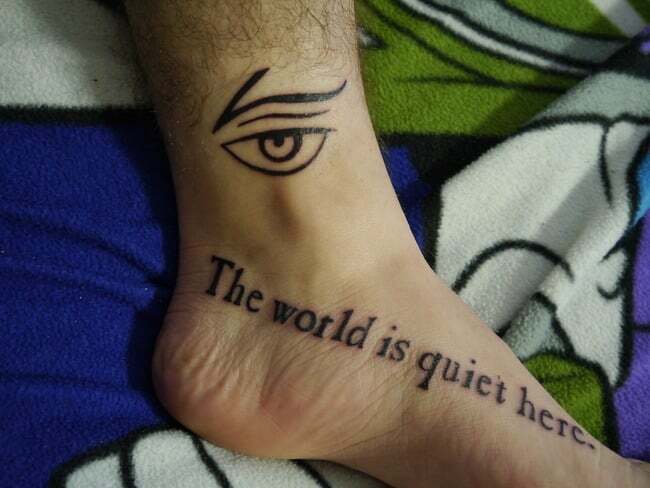 Outlined in heavy black ink with an excellent shadow effect, the words “The World is Quiet Here” are shown beneath an eye. This medium-sized tattoo is the perfect style for men looking for something different. The quote is set on a diagonal to the eye symbol, giving lots of movement to the design. 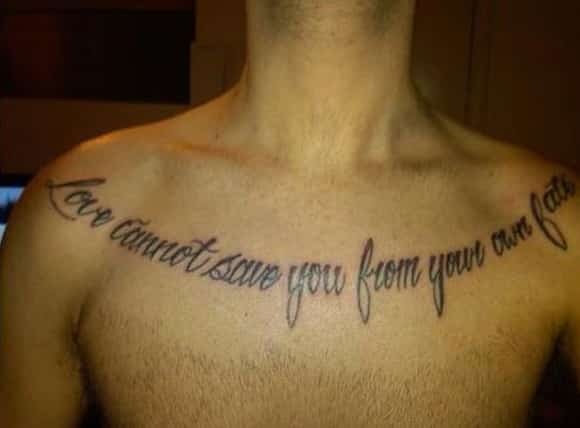 With its thin black font and clever use of space, this smaller tattoo incorporates a unique quote. 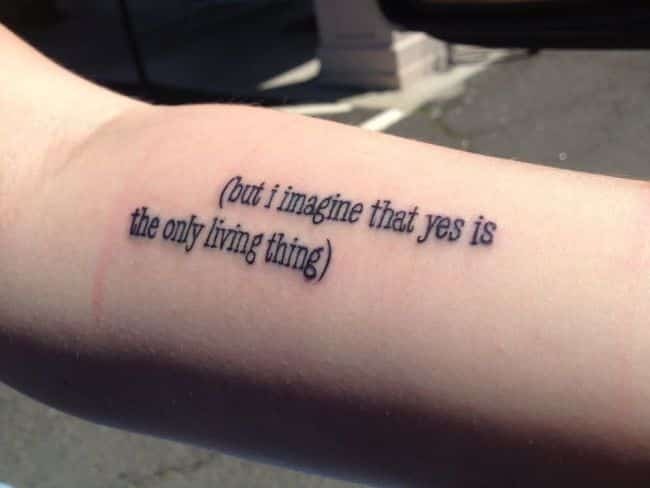 In parentheses (one offset slightly to the left, the other to the right), the words “but i imagine that yes is the only living thing” are printed. True to modern style, this quote is written in all lower-case letters. Another lower-case lettered design, this all-black image features a slightly heavier black outline. 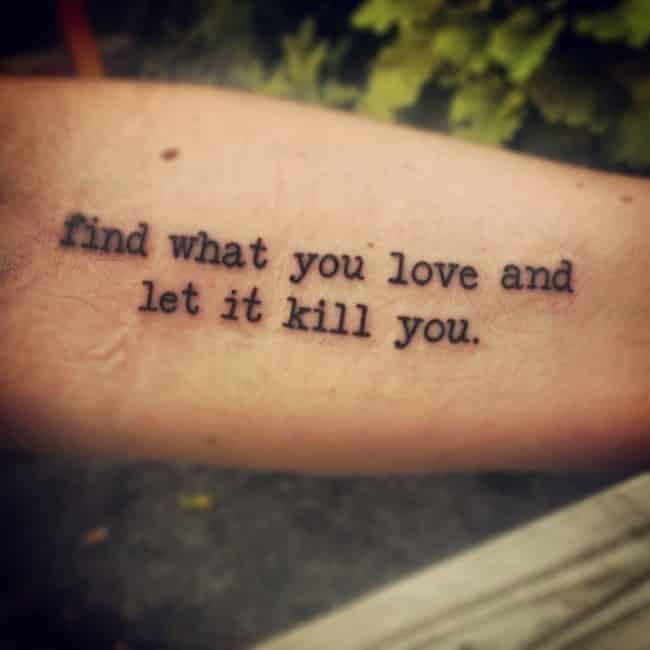 Inspiring people to pursue their passion even when it hurts, this saying (“find what you love and let it kill you”) is the perfect quote tattoo for men who are looking for something classic and meaningful. 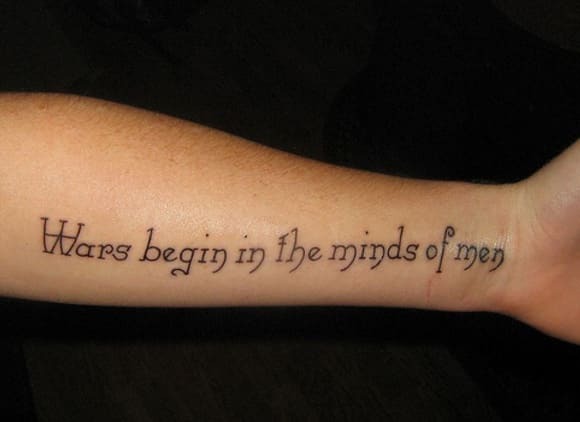 Incorporating a medieval-inspired font, this quote serves as a reminder that all wars and conflicts begin first in the mind. This non-violent message, written in thin black ink, will resonate with many people. The Gesture Hunter, by David Means, is the source of the quote for this tattoo idea. Written in thin cursive script, this elegant design is ideal for those wanting a medium to large tattoo design. Another perfect choice for those wanting a large tattoo, this design includes a quote from Jim Morrison. Crossing the entire body, from shoulder to shoulder, this tattoo curves into a smooth arc shape, with elegant cursive script. Taken from the Bible’s book of Genesis, this design features part of the creation story. Inked in a modern, bold font, the first letter of the quote is set within a block in an old-style type, just like old books or manuscripts were sometimes done. 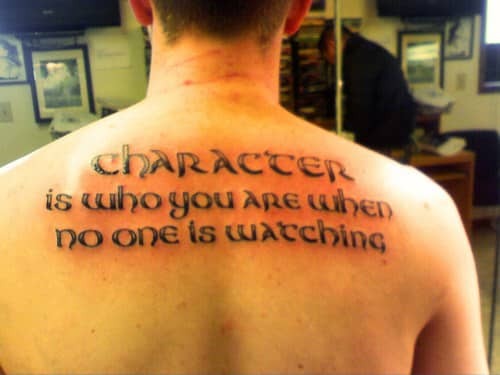 With its raised type and effective shadow technique, this tattoo is a powerful reminder of the importance of character. 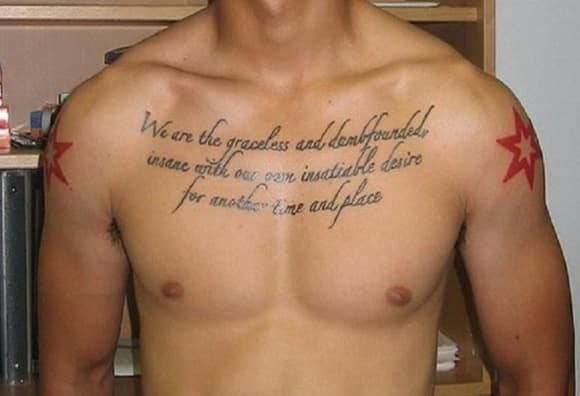 A larger size tattoo, it features a stylish font, with the first word centered above the rest of the quote.